Gelato is that dense, super-rich, intensely-flavored Italian version of ice cream. There’s really nothing else quite like it. Gelato is a delicacy that dates back thousands of years. The earliest beginnings of frozen desserts are recorded in 3000 B.C. when Asian cultures discovered they could consume crushed ice with flavorings. Five hundred years later, it became a custom for Egyptian pharaohs to offer their guests a cup of ice sweetened with fruit juice. Italians joined in as the Romans began the ritual of eating the ice of the volcanoes, Etna and Vesuvius, and covering it with honey. It was during the Italian Renaissance, when the great tradition of Italian gelato began. The famous Medici family in Florence sponsored a contest, searching for the greatest frozen dessert. A man named Ruggeri, a chicken farmer and cook in his spare time, took part in the competition. Ruggeri’s tasty frozen dessert of sweet fruit juice and ice (similar to today’s sorbet) won the coveted award. The news of Ruggeri’s talent traveled quickly and Caterina de Medici took Ruggeri with her to France. Caterina was convinced that only he could rival the fine desserts of French chefs – and had him make his specialty at her wedding to the future King of France. In the late 1500’s, the Medici family commissioned famous artist and architect, Bernardo Buontalenti, who was also known for his culinary skills, to prepare a beautiful feast for the visiting King of Spain. Buontalenti presented the King of Spain with a visually pleasing, creamy frozen dessert that we now call gelato. Buontalenti is considered the inventor of gelato. But it was Francesco Procopio dei Coltelli, a famous restaurateur, who made gelato famous all over Europe. Procopio moved from Palermo to Paris and opened a café that soon became the hub for every novelty, from exotic coffee, to chocolate, to a refined gelato served in small glasses that resembled egg cups. The Procope, as the café was known, soon became hugely successful and gelato spread throughout France and into other parts of Europe. Gelato made its way to the Americas for the first time in 1770, when Giovanni Basiolo brought it to New York City. At this point, there were two types of gelato – one made by mixing water with fruits such as lemon and strawberries (also known as Sorbetto), and another made by mixing milk with cinnamon, pistachio, coffee or chocolate. By 1846, the hand-crank freezer was refined and changed the way Americans made this frozen dessert. The freezer kept the liquid mixture constantly in motion and kept it cool throughout, making a product that was no longer granular, but creamy. This is where the history of industrial ice cream began, as the product contained more air and was less dense. Gelato did not make a name for itself in the U.S. until the late 1900’s – although its popularity still had a long way to go. The process of making gelato has evolved over thousands of years. In the beginning, gelato was made with a few simple ingredients. Egg yolks were used as the main stabilizer and were added to other raw ingredients, such as sugar and milk (sometimes water for sorbetto), heated in a large pan/bowl and then chilled. Flavor ingredients (fresh fruit, nuts, chocolate, etc.) were then added and the gelato was batched. Batching gelato is also known as the process in which the gelato is frozen and air is incorporated into it to give it its dense, smooth texture. This tedious old fashioned process only allowed gelato makers to be able to make a maximum of 4 or 5 traditional flavors and the shelf life was not long. Few gelato makers still use this process, as technology has redefined the traditional gelato making process without compromising taste and flavor. 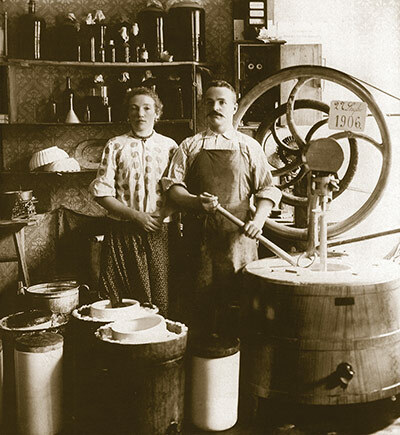 At the turn of the 21st century, a new way to make gelato, known as the Hot Process, was introduced. Widely used today, the Hot Process involves the use of a pasteurizer, which heats the gelato ingredients up to 85°C/185 F for 5 seconds and then drops the temperature to 5°C/41 F. This controlling of the process allows for stabilizers and emulsifiers to perform properly and creates a microbiologically safe mixture. After the going through the pasteurizer process, the gelato is placed in a batch freezer. Here, the mixture is quickly frozen, while being stirred, to incorporate air that produces small ice crystals necessary to give gelato a smooth, creamy texture with a satisfactory percentage of air. There are some gelato machines that contain both a pasteurizer and a batch freezer, which can simplify the process. The Hot Process is generally used for gelato because it can allow for more flexibility in the customization of a recipe and offers a slightly longer shelf life than all of the other processes. In the 1980’s, the Cold Process was developed to provide a simpler gelato making process. The ingredients used in the Cold Process are already microbiologically safe which eliminates the need for a pasteurizer – not only saving gelato shops costs, but also space, as it is one less piece of equipment. In the Cold Process, the raw ingredients are mixed with a Cold Process base and flavor, and placed directly in the batch freezer, where the gelato is batched and prepared for serving. While the shelf life is slightly less than the Hot Process, the Cold Process is the answer to the gelato makers’ need for a process that achieves a greater amount of gelato in a quicker timeframe without compromising taste. While the gelato market continues to develop, the needs of the gelato maker have continued to grow and/or change. The Sprint Process is the newest process to make its way into the industry, offering an even easier and quicker way to produce gelato without the intervention of a skilled gelato master. The Sprint Process is simple; add a liquid ingredient (water or milk) to a prepackaged mixture containing all of the raw ingredients including, flavors, stabilizers and emulsifiers. Then, the mixture is poured into the batch freezer. The Sprint Process allows little room for error and provides complete consistency in flavor every time. For gelato shop owners producing large varieties of flavors in a short period of time, the Sprint Process works best. On the downside, the Sprint Process doesn’t leave much room for flavor experimentation and creativity. Regardless of the process used, when the gelato has completed its cycle in the batch freezer, the next step is extraction into the gelato pan. Here’s where the difference in presentation between gelato and American ice cream reveals itself. Gelato is extracted using a spatula, rather than an ice cream scooper. The spatula helps to create creamy waves of gelato that are visually appealing in the display case and truly give gelato its artisanal feel. In some instances, gelato makers do not immediately serve their gelato, but utilize a blast freezer. 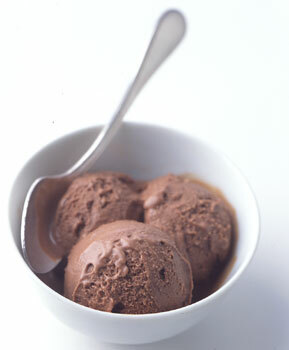 The blast freezer contributes to the life of the gelato by freezing it at a lower temperature than a standard freezer. This also helps it maintain its artisanal presentation. The final step in all gelato processes is decoration. Here the gelato maker can add to the gelato texture, flavor and appearance by adding toppings and fillers (also known as Arabeschi®). Thankfully, we don’t have to travel all the way to Italy every time we crave a scoop. Mario Batali shared a few tips on how to make gelato successfully at home. • Use Whole Milk – Batali points out that cream tends to coat the tongue and mute the taste of other ingredients. Whole milk delivers cleaner and more vibrant flavors. • Look for Overripe Fruit – Overripe fruit might not be great for eating, but they’re fantastic for delivering intense fruit flavor in gelatos. Here’s where to use those last few bruised peaches or the slightly-shriveled cherries. • Under-Churn the Base – Gelato is supposed to be less airy than American ice cream and should actually end up fairly dense. Batali recommends stopping the ice cream machine when the mix looks like a thick custard and then freezing. In a small bowl combine 1 cup milk, cornstarch and sugar. Using a wire whisk, combine the ingredients until the cornstarch is dissolved and the mixture is smooth. In a medium-size saucepan over medium heat, combine the remaining 3 cups milk and the vanilla extract. Stirring occasionally, heat the mixture to almost a boil; stir in the cornstarch mixture and let simmer from 5 to 8 minutes, or until thickened, stirring constantly. Remove from heat and transfer the mixture to a bowl. Cover and refrigerate until completely chilled, preferably overnight. Prior to using the custard mixture, pour the chilled custard through a strainer into a mixing bowl to clear out any clumps that may have formed. Store in the refrigerator until ready to use. Prepare the Pistachio Cream (see below). Transfer the mixture into your ice cream maker and freeze according to the manufacturer’s instructions, remembering Batali’s recommendation to under churn. When the gelato is done, either serve immediately or transfer to freezer containers and freeze until firm. Place the pistachio nuts, sugar and olive oil in a food processor. Blend/process, adding the hot water (1 tablespoon at a time to control the consistency of the cream) until pistachios are a smooth, creamy consistency that blends freely in the blender (You may not need all of the hot water). When done, cover and refrigerate until ready to use. Makes approximately 1 cup. Bring 2 1/4 cups milk just to a boil in a 4-quart heavy saucepan over moderate heat. While milk is heating, whisk together sugar, cornstarch, salt and 1/4 cup (cold) milk in a bowl until smooth, then whisk into boiling milk and bring to a boil over moderate heat, whisking. Boil, whisking frequently, 3 minutes (mixture will be very thick). Remove from heat. Place choclate in a bowl. Bring remaining 1/2 cup cold milk to almost a boil in a 1-quart heavy saucepan over moderate heat and then pour over the chocolate in the bowl. Let stand until chocolate is melted, about 1 minute, then whisk until smooth. Stir into the cornstarch-milk mixture and force through a fine-mesh sieve into a bowl. Cool slightly, stirring frequently to prevent a skin from forming, then cover with wax paper directly on the surface of the mixture and chill until cold, at least 1 1/2 hours (overnight is even better). Freeze mixture in ice cream maker, then transfer to an airtight container and freeze until hardened, about 3 hours. Let soften 5 minutes before serving. Note: Gelato keeps 1 week. Thanks for including my post in your list of related articles. We find gelato a bit easier to make than ice team, and it works well with freshly picked fruit. Fresh fruit adds another great level. Thank you for visiting this blog and for your comments. My mouth is watering yet again! Love gelato and love this in-depth post! Thanks Patty. Ready made gelato is probably easy to find in your part of the world.